In or Automnal: Arriere-Saison en Nouvelle Angleterre Roy Lichtenstein integrates material from advertisements, comics, and the everyday, bringing what was then a great taboo—commercial art—into the gallery. 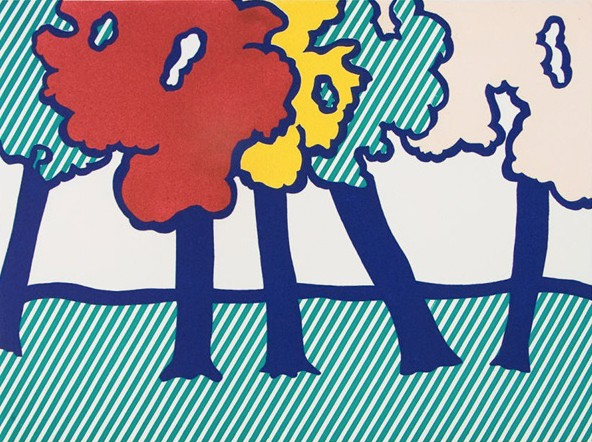 or Automnal: Arriere-Saison en Nouvelle Angleterre by Lichtenstein integrates the readymade quality of screen prints and a painterly gesture with the use of thick lines, flat surface planes, and obscured perspective. The horizontal orientation of the flag depicts Lichtenstein’s signature dots. A tension between the painter’s hand and mechanical reproduction is exhibited in this work.